Franz Sigel (1824-1902), Maj. General, USA (Germany/ MD/NY). Pea Ridge, New Market (defeated by Genl. Breckinridge and VMI cadets). 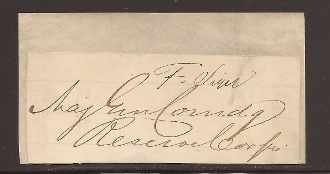 War date clip autograph as Maj. Gen. Comdg. Reserve Corps (Department of West Virginia 5/24-7/08/64). Mounted. Fine.